If you are planning on cooking a ham, perhaps for a picnic, or a summer lunch, you’ll be left with a beautiful, delicate stock – full of flavour and character. I freeze it in batches and whip it out when I’m cooking anything that calls for a good meaty stock. 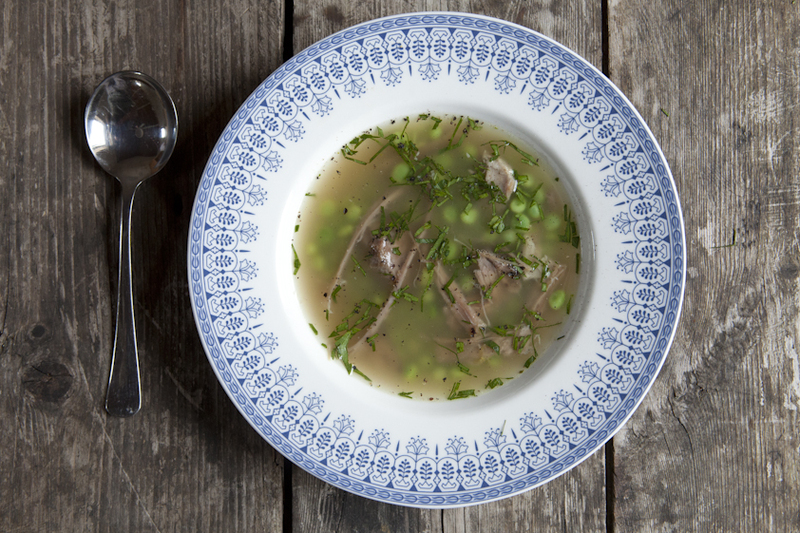 This soup, in all its wonderful simplicity, is clean, vibrant and refreshing. The unique, rounded flavour of lovage makes it particularly special. If the stock is cold, remove any fat that may have set on top of the stock, then pass the stock through a muslin-lined sieve into a clean pan. Bring the stock to a gentle simmer. Add the shredded ham and peas and cook for 2–3 minutes. Finely chop the lovage and add to the soup. Taste and adjust the seasoning, adding pepper, and a little salt if needed. Serve with good, fresh bread and butter.